Welcome to Out of Print, my series of reviews on films that are currently unavailable on DVD, for one reason or another. Sometimes, they can only be found on VHS or Laserdisc and never made it to DVD. Other times, these movies have gone out-of-print, meaning they were released on DVD at some point in the past, but they’ve stopped being manufactured. Either way, many of these films are now hard, if not impossible, to track down. Each entry will look at a different film, and explore the possible reasons why it isn’t currently available for purchase. Whether a movie’s marred by copyright issues, surrounded by controversy, or perhaps is just terrible, I’ll get to the bottom of things. It’s been 15 years since The Blair Witch Project exploded into theatres, and it is strange to think that before that shaky-cam horror flick hit the big screen, “found footage” was not considered a genre. It was reserved for the kinds of films that you’d see at either an art house or a grindhouse, and far from the staple of horror and sci-fi films it’s become today. In fact, before The Blair Witch Project, less than ten movies released in theatres had been filmed in that style. I’d like to take this opportunity to tell you about one of those films, which sadly has not seen the transition from any outdated media formats to DVD: 1989’s 84 Charlie MoPic. 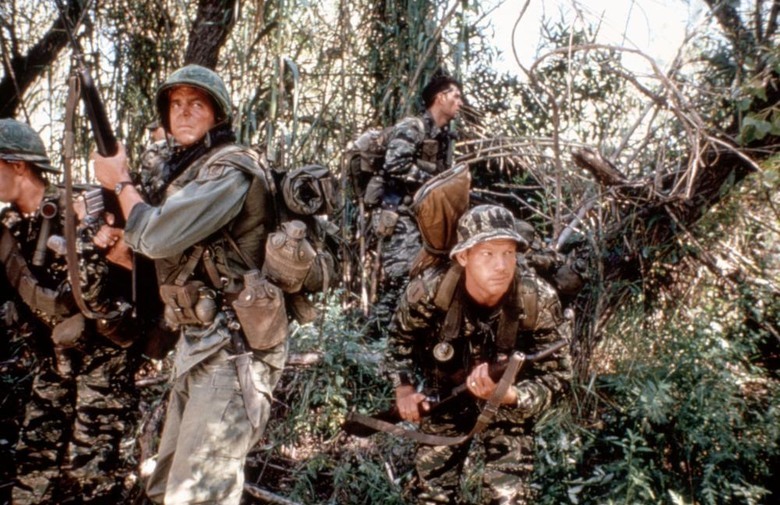 Written and Directed by Patrick Sheane Duncan, and influenced by his own experiences during the war, 84 Charlie MoPic follows a patrol team on a dangerous mission during the Vietnam War. (The title refers to the military code 84C, or “84 Charlie,” given to army cameramen during the war.) The whole film takes place from the point of view of a cameraman assigned to follow the patrol on a mission deep into the jungles of Vietnam and bring back the footage to show new recruits in America. Of course, what starts as a typical recon mission soon ends up taking a turn for the worse. The film makes great use of the first-person POV of the found-footage genre, and brings you into the action and along for the ride. There are also some great moments where members of the team open up to MoPic and tell him about their history with the squad, as well as their lives at home, so you really do become invested in the characters. None of the actors from 84 Charlie MoPic that well-known, but that almost adds to the tension of the film, because it isn’t obvious which actor is the star or focus of the movie, leaving any one of them susceptible to an untimely fate at any moment. I watched this film on Laserdisc because, sadly, it is not available on DVD – at least not in North America. It was released a few years ago on DVD in England, but the film has yet to be ported over to Canada or the United States. With war films never really falling out of favour, and found-footage all the rage these days, one would think that this film would have been put out on DVD already, but sadly, that isn’t the case. And with no star power to speak of, an incredibly low budget, and the director having not been behind a camera in years, there probably won’t be a release of it any time soon. Another issue is the use of two songs by the singer Donovan in the film. Since this was a small independent film, they likely only licensed the rights to the music for its initial release, which would explain why it was only released once on VHS and once on Laserdisc back when it first came out. The cost of relicensing the songs now is probably just too costly for such a small film. Currently, the only way to check 84 Charlie MoPic out is to try and track down a copy on VHS or Laserdisc, or to stream the film on YouTube, where it’s been uploaded in its entirety. I highly recommend you do try and watch it, because it provides a great perspective on war from a unique point-of-view, it has a great story, and while the cast isn’t packed with stars, it still features a number of great performances. The last 20 minutes of the film is the kind of viewing experience that you will find yourself thinking about for days afterwards, and is not to be missed. Alex Patteson studied journalism at Mohawk College, where he often focused his stories on the entertainment world. He currently writes a blog with his girlfriend about their garage sale finds, oursaturdays.wordpress.com.